You can also permanently change your fan speed as well, I believe there is a *.xex that will do it for you, you can set it from 10 - 100% and it works great! It flashes a small proportion of your SMC (if I remember correctly) which changes the fan speed's from a dynamic to static state, although can be set back to auto using any other fan control software (FreeStyle Dash, etc). Which version of FSD do you run legendary? I simply went into the settings menu or something of my RGH'd console, went to fan speed and changed it to 100%. Whenever my console boots, first it plays the 360 splash screen, then the fans start to roar and FSD boots to the main menu. I never have to constantly change my fan's speed from auto to manual 100% every time I turn the console on. I think the .xex file you refer to may have once been a separate executable for older version of FSD. My guess is that the FSD coders simply built this into the FSD dash software. Didn't they do the same thing with the system link patch or was that always included with dashlaunch from the very beginnings of the program? That is because it is setting your fan speed when your console boots, although if you were to disable FSD and launch another *.xex on boot-up, it wouldn't set the fan speeds! I used an alternative method which actually wrote the fan setting permanently into my flash so regardless of what I did, my fans were always running at what I set them to! When I had my JTAG I didn't have any of that integrated into Ddashlaunch, but then once again that was when dashlaunch did nothing more but launch an application at startup! It might have been integrated into dashlaunch now though, I haven't booted up my JTAG in a very long time! Out of curiosity, which mod-chip did you use to perform your RGH? I'm not sure which one I should choose for my Slim (Trinity) as it's been sitting around way to long to not hack it! That would explain why you suggested the app for fan speeds since you were running a modded console a while back. 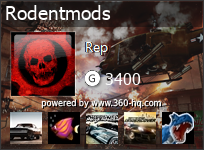 I just entered the 360 modding scene. It sounds like they integrated a lot more things with dash launch now. My Freestyle dash 3 skin is beautiful. I upload shoot a pic of it here sometime. My guy used a cool runner chip in my phat console. He said they are the best kind for RGH. I think most tutorials on youtube use them as well. I really need to get xex menu installed on my console. Can you run mupen64-360 through xex menu? So far it seems people boot the N64 emulator by hitting the eject button to boot into Xell and have mupen64-360 on a flash drive. Have you ever used mupen64-360? Cool man! I've been wanting to mod my Xbox 360 for a while now, but I'm not sure if I want to shell out the money for it. I'm also not to the point where I'm sure that I'll never use Xbox Live again. Isn't the R-JTAG also the preferred modding method right now over the RGH? 1.) If your dash is below 4548, you can do the king kong softmod, which was created by chaos computer club (I think) just to boot linux for fun's sake. My RGH guy said if you pop any newer xbox game into an unmodded 4548 or below console's drive M$ automatically upgrades the dashboard. 2.) If your console is below 7371 you can jtag it. 3.) If you have a console above 7371 you can RGH I the console. That's what I did because my dash board was 8XXX. 4.) If your dashboard is above 14XXX or something like that you use RJTAG. NOT RGH II. My guy told me that when team xecuter was coming out with RGH II, someone leaked their work. They got mad over it and only finished the code for slim consoles. If you try to use RGH II for phat consoles you get the infamous 15min boot times. RJTAG is specifically for phat consoles above the 14xxx dash and uses Q-USB chips I believe. You should NOT use RGH II for phats over 14xxx is my understanding. also make video of your console when its completed with Free ring of light mods. Not trying to avoid any rules here. just trying to help out. for those of you that might be interested.